Afua Cooper is the James Robinson Johnston Chair in Black Canadian Studies. 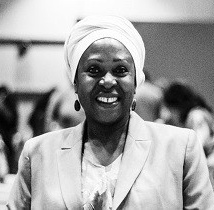 Her research interests are African Canadian studies, with specific regard to the period of enslavement and emancipation in 18th and 19th century Canada and the Black Atlantic; African-Nova Scotian history; political consciousness; community building and culture; slavery’s aftermath; Black youth studies. Dr. Cooper founded the Black Canadian Studies Association (BCSA), which she currently chairs. Read about its first conference here. Forthcoming. 'Voices Heard Over the River: Henry and Mary Bibb, and the Role of the Black Press in the Underground Railroad Abolitionist Movements,' in A Fluid Frontier: Slavery, Freedom and the Underground Railroad in the Detroit River Borderlands, eds. Karolyn Smardz and Veta Tucker (Detroit: Wayne State University Press). 2009. 'A New Biography of the African Diaspora: The Odyssey of Marie-Joseph Angelique, Black Portuguese Slave Woman in New France, 1725-1734,' in Darlene Clark Hine, ed. Global Conversations: New Scholarship on the History of Black Peoples (University of Illinois Press), p. 46-73. 2007. 'Unsilencing the Past: memorializing Four Hundred Years of African Canadian History,' in David Divine, ed. Multiple Lenses: Voices from the Diaspora Located in Canada (UK: Cambridge Scholars Publishing), p. 11-22. 2007. 'Acts of Resistance: Black Men and Women Engage Slavery in Upper Canada, 1793-1803,' Ontario History 99, 1: 5-17. 2006. The Hanging of Angelique: The Untold Story of Canadian Slavery and the Burning of Old Montreal (Toronto: HarperCollins). Published in French in 2007 as La Pendaison d’Angelique. Translated by André Couture. (Montréal: Les Éditions de L’Homme). Published in the USA in 2007 by the University of Georgia Press.